From the "amusing people down" to the 1690 Peter I was formed two regiments: Preobrazhensky and Semenovsky. In 1700, they acquired the status of the Life Guards and the first major battle of the Great Northern War, Narva, was acquitted of honor Guards name. Provide decent resistance to the Swedish army, they saved the Russian army from total destruction. Under the banner of Peter Preobrazhensky and Semenovsky participated in all the military events of Russian history of the first quarter of the 18th century. Preobrazhensky regiment consisted of four, and Semenovsky - three battalions, four delivshihsya fuzeler company. Both also had shelves of the Grenadier company and an artillery command. Grenadier Company in both regiments consisted of three chief officers, 8 non-commissioned officers, 179 corporals and privates, 3 and 4 drummers noncombatant ranks. In the most stalwart grenadiers were selected, and strong men, trained throwing hand grenades. Grenades (Grenada) represented a hollow cast iron, steel or porcelain balls filled with gunpowder, with a pilot tube, laminated paper. Before throwing on a belt worn fusil over his shoulder bag and got it from a grenade. Grenadier teeth bit off the tip of the powder tube, took a burning fuse, retreated back foot, burned up, and threw a grenade. Threw a grenade, as a rule, only during the storm or in the defense of fortifications. 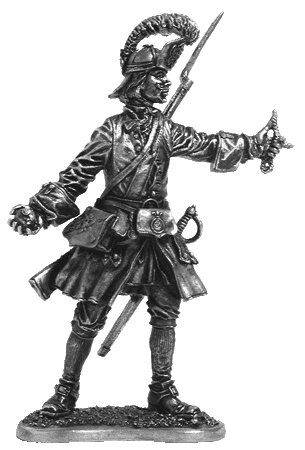 Uniforms of "French" type of guard for the first time was in 1702. In Preobrazhensky Regiment coat birthday declined from dark-green, and Semenovsky - from light-blue cloth. Cuffs, and lining covering the loop - red. Jacket and pants red stockings in different colors. Since 1712 both regiments Grenadiers wore black leather cap with two peaks, of which the front sewn vertically and decorated with pewter buckle with double-headed eagle. Over the rear visor, buckle under with the royal monogram, fastened a red ostrich feather. In 1720, both regiments received the same dark-green uniforms and since that time differed from Semenovtsky from the Preobrazhensky only color collars.